Hello! Karla here today! I have a Shadow box project to share with you. I have a couple of these and I like to change them up for each season. Here is my Christmas Shadow box. 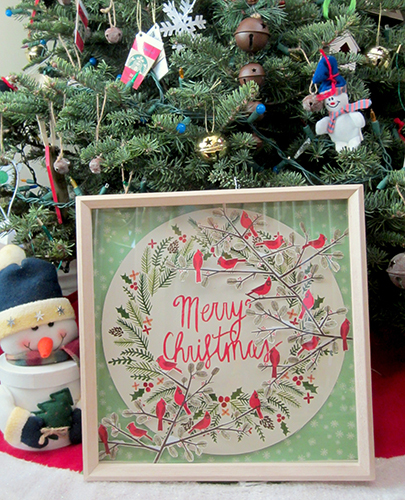 I used the Hand Painted Christmas and Merry Memories stacks. So, if you have both Jo-Ann and Michaels near you, don’t be afraid to pick up both of these stacks. They work well together for sure! 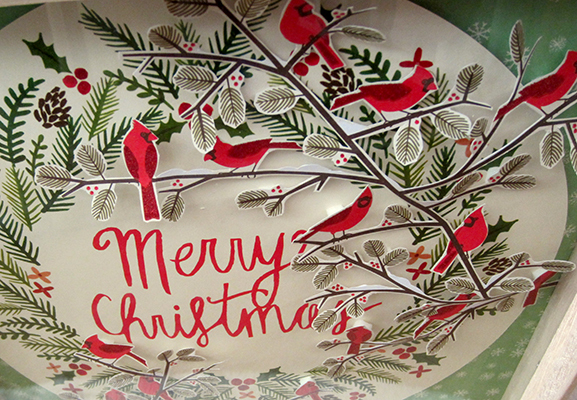 Both the background papers are from the Hand Painted Christmas stack and the birds are from the Merry Memories stack. I fussy cut them and they came to life right away. I adhered them to the background pieces with pop dots. I stacked 2 dots together on some birds and used only one on others to vary their heights. I curved some of the branches just a little bit to give them more dimension as well. It was surprisingly quick to make and it looks much more complicated because the papers are so beautiful and detailed! I can’t believe December is here!!! Are you decorating for the holidays? I'd love to see :) Leave us a picture in the comments or share one with us on our Facebook page. Until then, have a great day! !